It was a day for records at Nunholm on Saturday as Russell Johnston and Richard Rennie took JMS Nunholm to an astonishing score of 346 for the loss of no wickets in 50 overs against Albert Park in Western Union Division 2. 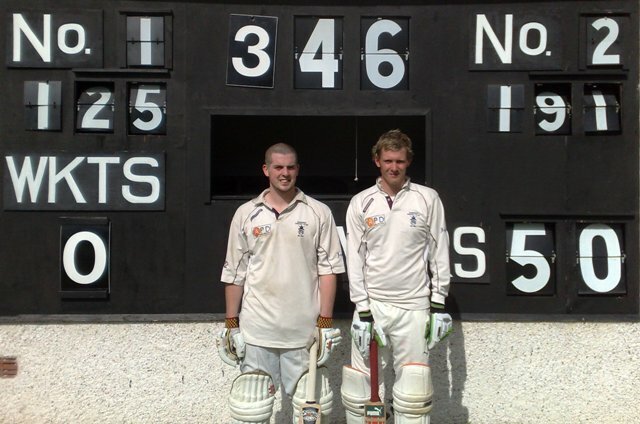 Johnston scored 191 not out, his second century of the season and his highest score, and Rennie scored 125 not out, his maiden century for the club. Andrew Kyle with five wickets and Chris McCutcheon with three avoided the anticlimax of a draw by bowling Albert Park out for 121 in the 34th over to seal an emphatic 225 run win. Despite the scoreline Weirs bowled steadily however their fielding was fallible and Johnston and Rennie exploited this by running effectively. It was in the last twenty overs that the dam burst and those yielded nearly 200 runs. This opening partnership is surely a candidate for several club, league and Scottish records. Meanwhile the first XI, APD Dumfries, were missing five experienced regulars away at Weirs in National League Division 2. However a team effort from a young side produced a dramatic last ball win by two wickets chasing 184. All five Dumfries bowlers stuck to their task and Jerry Goodin was rewarded with three wickets and Robert McBride two. However from a position of 114 for 8 Weirs rattled up 65 in the last eleven overs to wrest the initiative. Dumfries had a measured reply with Alan Davidson scoring 28 and Drew Dawson 38. Six wickets were left but 65 needed off just 8 overs required a special effort. Tommy McBride with a rapid twenty and stand-in skipper Josh Geary with 36 not out put Dumfries in the frame. Twenty were needed off the last two overs with three wickets remaining. Then it was eight off the last over and then two off the last ball. Robert McBride successfully scored that two for a dramatic win. The third placed side play SMRH at home this Saturday. On Sunday the Dumfries XI stayed top of Strathclyde Division 3 with a comfortable 49 runs win over Kelburne. Chris Bellwood top scored with 66 and Josh Geary scored 51 as they totalled 251. Kelburne scored 202 all out in reply.